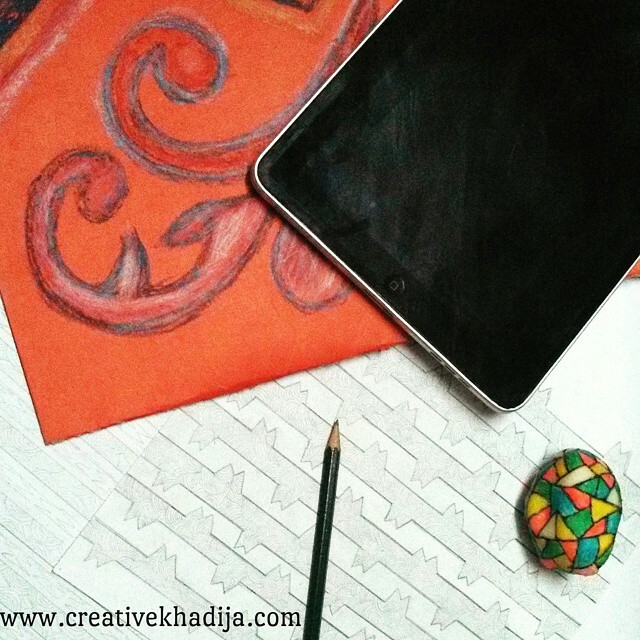 A proper craft space is very important for an artist or crafter, Creative kind of work needs good concentration which can positively done only when you have a proper space. 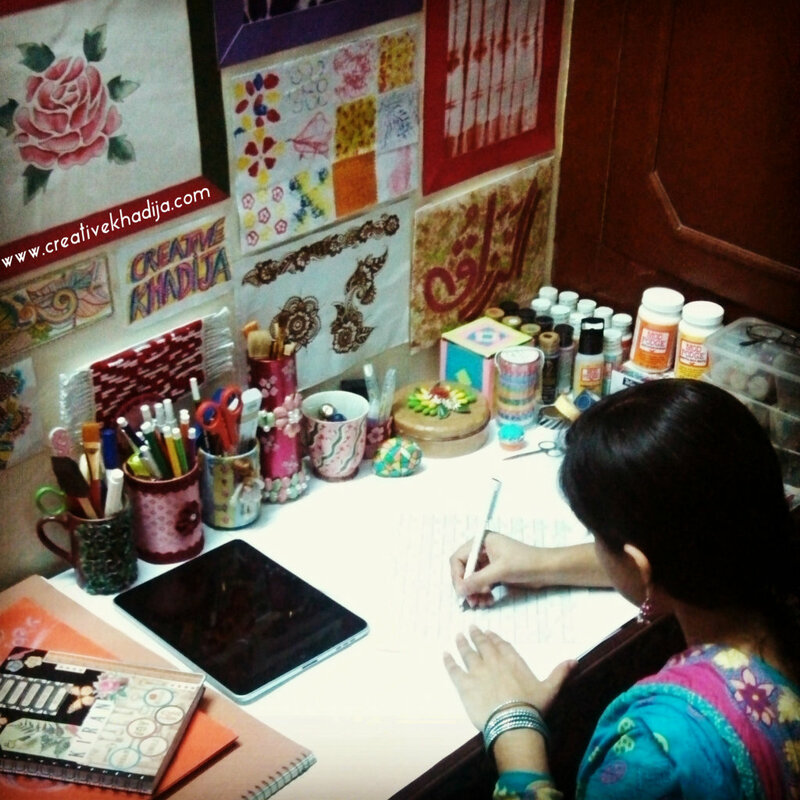 As I am blogging from more than 4 years, So when I were a student, my study room was my part time craft room, haha! Every weekend my study table used as a craft table then. Oh God what awesome time I had during blogging..from start to still its a fun journey! After the student life, I were more attach to my bedroom area, so I left the study room & design a crafty space in a corner of my bedroom! Today I will be sharing my tiny & simple crafty corner with you all. My craft space is not so messy because the crafty stuff I am not using mostly I keep them all in the corner cupboard,I get many craft supplies from the international brands & affiliate companies, so the extra stuff & boxes are inside although some supplies are on the work table. 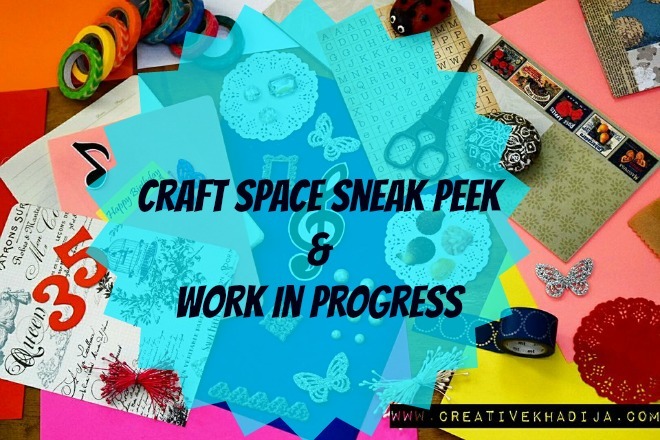 So here is a sneak peek of Me & my craft space! 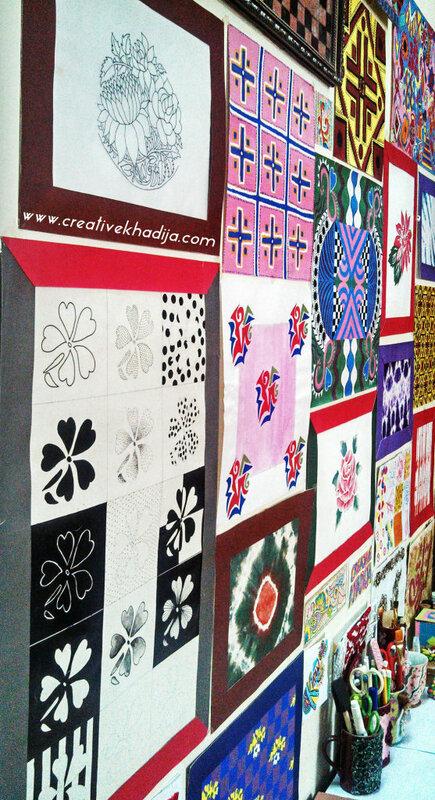 I am comfortable with my floor sitting work space area, My craft table surface is made of glass but I cover it with white sheets, so I can take photographs with plain/clean background & its also easy to change when the sheets are dirty. Usually it takes about 2 months when I change. isn’t it fun idea for a craft table surface? I rarely like sewing, Remember once I sew this floor cushion cover. 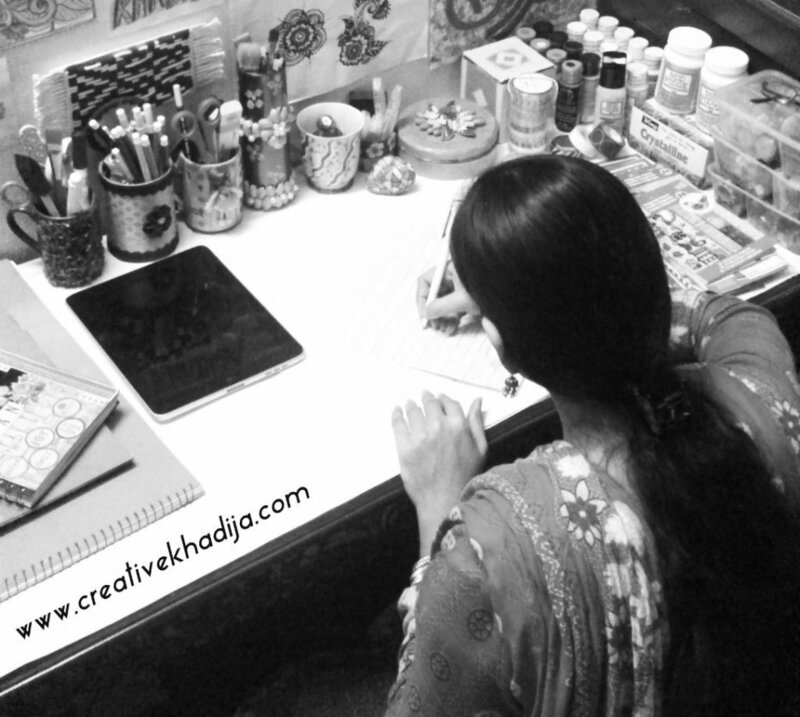 Oh Yeah..its Me here.. Khadija Kiran.. working on a project at my comfortable craft space, its probably the most relaxing area for me. I have my gadgets on the table along with other work essentials. 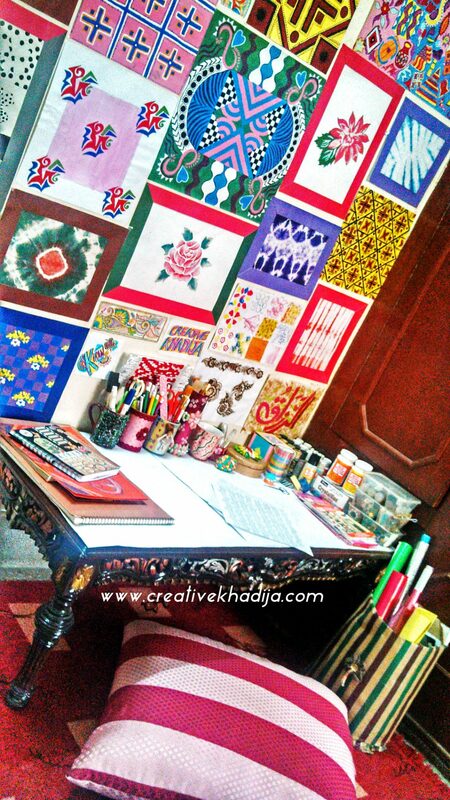 This wall is filled with all of MY own art work, a few belongs to my textile design studies & a few are those which I paint on & off sometimes for blog, Some freehand drawings, Some tie & dye fabric pieces as wall art. 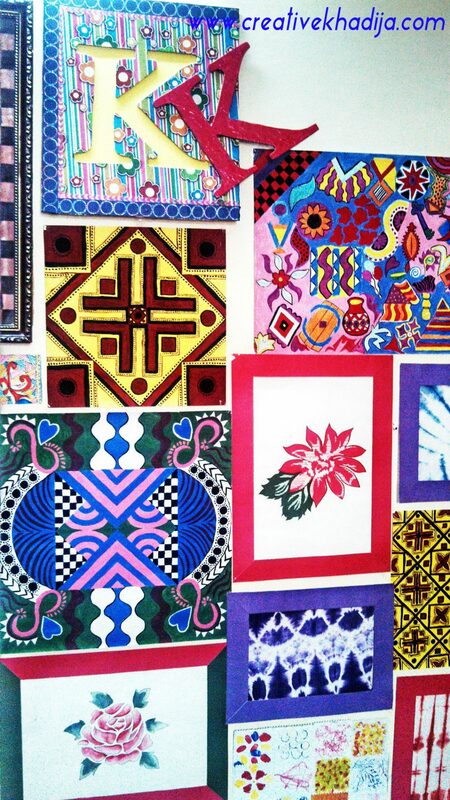 This big wall art is a wax batik work I did in past, it was difficult but the end result was just perfect! I made a glass paint wall hanging with this rose design as well. I share my Monogram wall art DIY with you, So its necessary to have it here on the wall. 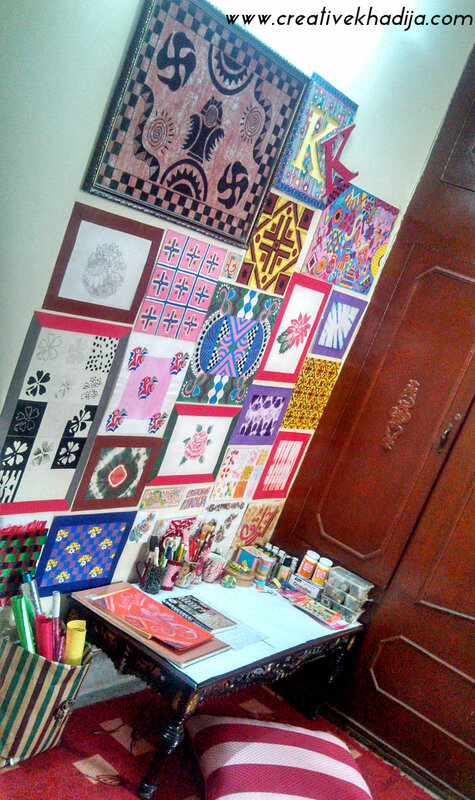 I did some ajrak work paintings & some repeat designs during my textile design studies. Here you can also see tie & dye designs. 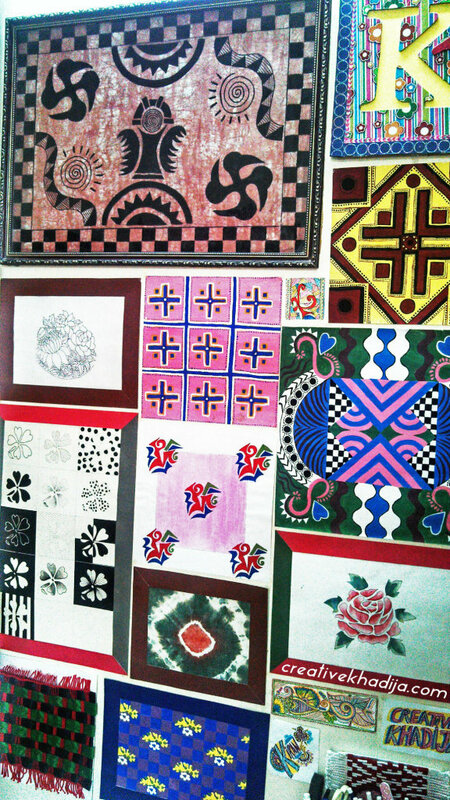 These were paper work samples actually but I fix these in my wall art. I like sitting in front of this wall art which is totally designed by Me. I have so many other wall arts, paintings, big frames but I have a small wall and fixing all of the frames here will be looking so messy, That’s why I am using just a few of my paintings & art work at this wall. Working at this colorful place is always making me happy & more creative! I am a big fan of reuse/recycling. 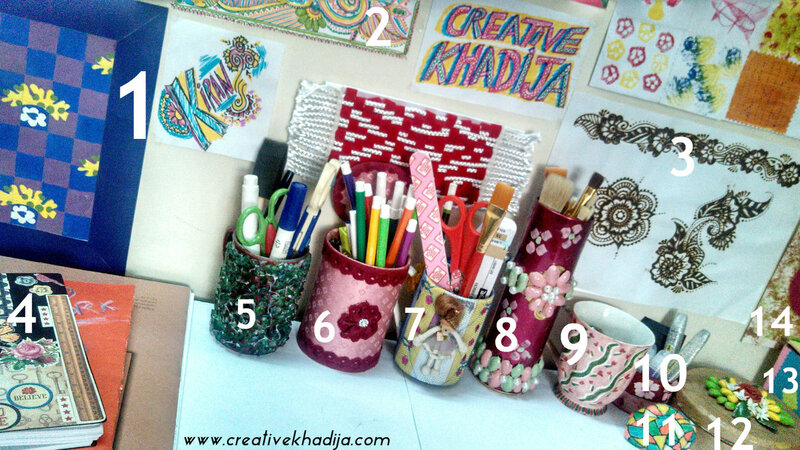 Here you can see my craft supplies organizers, all of these are made by me, in fact I have shared the tutorials. these broken mugs & food tin pack up-cycling; is just fun! Hey did you notice the KIRAN drawing here, its my DP at almost every social network. Right! 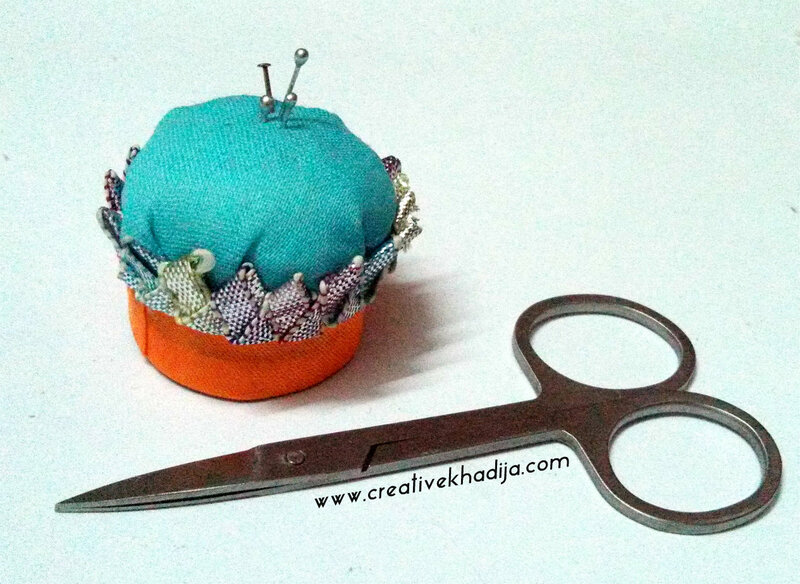 A white background is helping me in taking pictures of the small objects, I made this tiny pincushion with a lid of water bottle. During the work, I am mostly online via my smart gadgets, my iPad is a good helping friend in blogging. I am okay with this small space, so what if its not so perfect according to my loads of crafty stuff but I am a very content person with all the things I have. Very much thankful & blessed Alhamdulillah.. Less is always More for me & I am satisfied always! I am having these closets with good space inside, so all of my extra crafty stuff is inside, No more junk on the table or around in the bedroom. It is said that if you will be thankful to the God Almighty, HE will be giving you more & this is what always happening to me! I am so thankful, my family suggest me to set up a separate new craft room, as my work is spreading day by day & I am working on some international projects so this space is sometimes getting messy! I am happy because my new craftroom renovation is going on these days! I will be having a big craft counter near the window & that would be more excited thing while photographing for tutorial pictures. I will be having big cupboard for the crafty stash & supplies. Right now I dont have enough space on my craft table for my laptop & iPad both, but at new counter I will be making place for both. There are so many plans & so much fun coming up. I will sure be sharing updates on & off related my new craft room, let’s see when I get some free time so I can work more on crafty room setting up..let’s see.. I was asked to share my Craft space by an international co-working company WeWork. I am glad to work with them, I am also invited to their office which is not in Pakistan actually, but I would love to visit one day! Well its great working with the WeWork Team! I am their proud co-worker now! My today’s sharing was not a tutorial post, but I hope you will like this difference. During these 4 years of blogging I were asked several times for this kind of sharing but I were always shy to share my messy space..haha..this time I were having a clean setup so I dont feel shy sharing my craft space area with all. 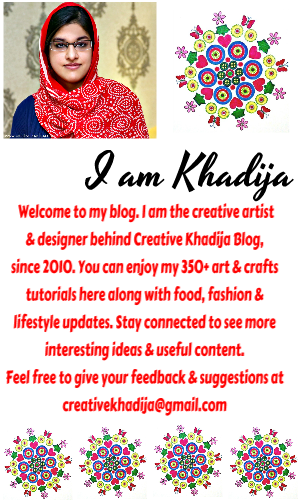 I hope you enjoyed Creative Khadija’s Craft Space, let me know your suggestions, ideas & anything you want to say about my craft space! I would love to hear from you all! I loved this post!!! What fun to see your cute creative space. So cosy and beautiful. Lucky you to have a bigger space in the works! but your comfortable corner is inspiring to me. Love the idea of white sheets, I always have trouble with photo backgrounds, and I never thought of that! 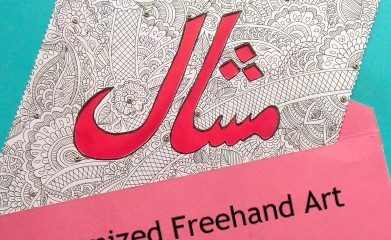 Thanks Mahnoor, mjhy pata tha you will love it all..stay blessed dear girl..
AMIGA KHADIJA …. UN ESPACIO BONITO, ACOGEDOR, Y COLORIDO…. JJEJEJEJEJ ME ALEGRO DE HABERTE CONOCIDO, AUNQUE HAYA SIDO DE ESPALDAS…. JJEJJEJEJE MUCHOS BESOS GUAPITA. Haha, thanks a lot dear. so you saw me first time..Thanks for enjoying. be happy dear. Awesome, you have arranged everything so nicely. This is really inspiring me . I will make my craft space also well organized. Thank you. Thanks Divya, I am also happy working at my colorful space! but many ideas in my mind about new craft room! my workspace gets very messy sometimes! 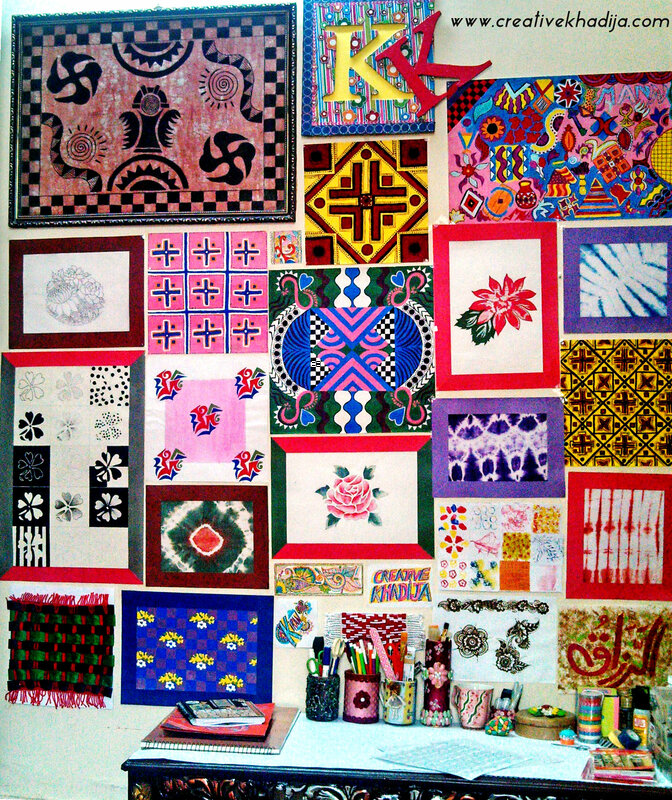 haha..
A very inspiring and colorful place to work from! Good job! Thank You Feral ! I enjoy my colorful space! Wow, it is gorgeous and truly unique! Love that wall! thanks so much for sharing on craft schooling Sunday! Thanks for appreciating a lot. glad yo know you liked! 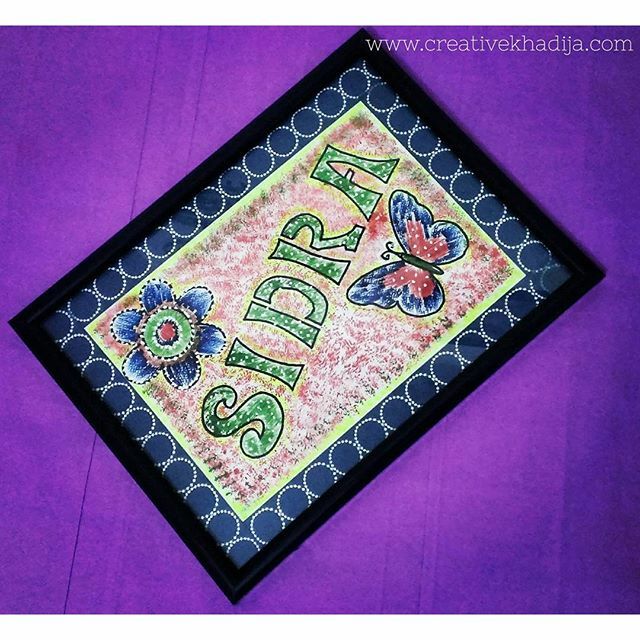 Wow Khadija ur crafting space is incredible :) Love how colorful it is. I would love to craft in a place like this ! Thanks! thats not an awesome place but not bad at all …I am glad you appreciate..
What a wonderful and beautiful craft space! It seems serene and the perfect place to feed your creativity. I would love if you would stop by and share this at my blog party, Celebrate It! It’s all about celebrating our everyday lives! 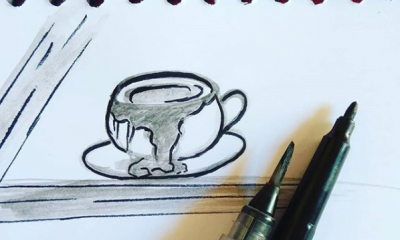 Sono d’accordo con te che uno spazio creativo sia molto importante per un’artista e il tuo è fantastico, ricco di colore e originalità. Complimenti! Thanks a lot Ninfa, it was really fun having a separate space! Wow. I feel I entered your most private space! It is beautiful and what a wonderful place to create. Thank you for linking it up with us at the Fine Craft Guild! So nice of you dear. Always welcome at my crafty space :) happy blogging! Yes really its a relaxing and interesting space for work! I enjoy really! Thanks for visiting and enjoying my space! Your craft table looks like a lovely place to work. Thanks so much for sharing. We hope to see you at tonight’s party. Thanks Debi, I will sure be sharing some more fun! 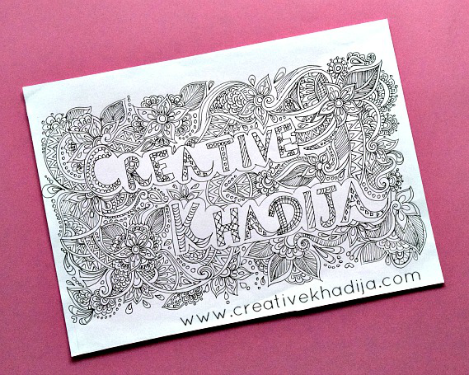 So nice to have a peek into your crafty world Khadija…and next time we need a facial photo too!! Thanks a lot.. haha..I will try..shy me..! !